Who or what is Deep Blue? 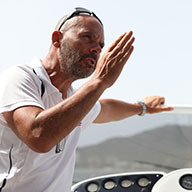 Deep Blue Sea Training is the fastest growing RYA Training centre in the Mediterranean. We are fully accredited to train from beginner to RYA Yachtmaster Ocean for sail, motor yachts, and on powerboats and personal watercraft. We also have radar simulators and a suite of the latest VHF training radios from ICOM and Standard Horizon that we use for realistic and effective training. Deep Blue Sea Training is a team of exceptionally qualified, fun and friendly Yachtmaster instructors with many years of experience and over 1000 students taught or examined with an exceptional pass rate. Whats the difference between Deep Blue and other sea schools? There are lots of things that make Deep Blue Sea Training different to other sea schools. Our instructors are qualified to the highest levels and own the business, so the long-term vision of the school as a Centre of Excellence for training is always uppermost in our minds. This means that we are interested in the long-term future of our students, your careers and aspirations, how you learn, how you enjoy your course and how you talk about Deep Blue. We have invested a significant amount in our bright, comfort-cooled classrooms with ergonomic seating, VHF and radar simulator suite, boats and teaching equipment. We also add more to our courses than anyone else both in terms of the time you get with the instructors and the materials we provide for you. For example, on many of our theory courses you get your own training materials to keep, and we provide published text books prior to the course that you can also keep, all within the course price. 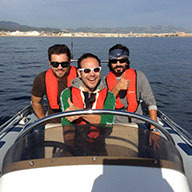 At Deep Blue Sea Training, we do NOT include examiner travel in our up-front course fees unlike other schools in Palma. This benefits our students - Further information. Your prices look too good to be true. Whats the catch? There is no catch. None at all. We don't cut corners. In fact the opposite is true, we add a number of extras with our courses that you simply don't get anywhere else. We can offer the best prices in the Med because we have invested in all of the things we need to run our school efficiently, and the savings we make we pass over to you. Unlike many schools, we actually run our own boats and our business is owned and managed by working Yachtmaster instructors. So the people who train you have a vested interest in the long term future of the school, and this makes a real differece to our approach and the very high quality of the training we deliver. Plus, we don't employ expensive admin staff nor pricey freelance instructors which is a big cost to any business, meaning we can keep costs down and run more courses, and pass these costs savings to our students through competitive pricing. What do I get when I book a Deep Blue course? Firstly you get personal attention from the start, and expert instruction from our friendly team in bright and spacious classrooms or on board our excellent training vessels. Our air conditioned offices benefit from loads of natural light, ergonomic classroom seating (we think you should be comfortable if you're going to embark on a theory course), the latest presentation equipment, free WIFI, complimentary tea, coffee, soft drinks and chilled water. Our modern boats are fully coded to MCA category 2 (60 miles from a safe haven), have a full compliment of safety equipment, and exceed the highest standards set by the MCA for commercial vessel coding. Many of our courses involve living aboard the boats for several days and we fully provision our boats with crisp, clean bedding and towels, as well as other essentials required on board. Depending on the course you are undertaking, you will also be given a full set of training materials to assist your learning. Can I train on my own boat? Yes of course. We would encourage boat owners who want to improve their skills and knowledge to train on their own boats whenever possible. 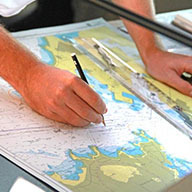 You can undertake most of our courses on your own boat if it is of an appropriate size and specification. 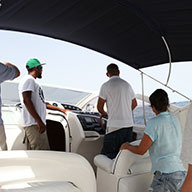 Please contact us for more information if you’re thinking of learning on your own boat. Can I build sea time with Deep Blue Sea Training? Yes. We offer mile-building trips throughout the year, including qualifying miles for Yachtmaster Offshore and passages for Yachtmaster Ocean candidates including sight-taking for astro-navigation. Our Complete Ocean Master course includes a qualifying 600 mile passage including sun-run-sun sights and compass check as standard. Why not call in or drop us a line if you are interested in building miles and gaining valuable sea time. What about if I introduce a friend? We’d love you to, in fact many of our students are recommended to us. We think it's a really great way for us to grow our business, so if you recommend a friend then we’d like to thank you with a voucher towards either some further training that you can take with us, or towards training equipment or books that we have available for sale at the school. Is fuel included in the course fee? Yes it is. The fuel for the course you take is included in the fee you pay. Exam fuel is also included. At Deep Blue Sea Training we use the fuel we need so that you get the maximum out of your learning time. Some of the team have worked at schools where the maxim was 'save fuel' ahead of 'do whats right for the students' - needless to say we didn't stay there very long! So at Deep Blue you get more miles included on your practical course - guaranteed! I'm concerned about learning in English as it's not my native language. What happens if I don't understand the instructor? 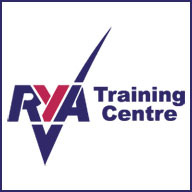 It is a fact that all RYA courses must be taught in English, but as an international sea training academy based in the Balearics we have many non-native English speakers as students of the school, and we structure our course delivery to accommodate those students who find learning in English a challenge. If you are keen to study one of our courses but unsure about the level of English required, please call or email and we can talk it through. Do you provide training materials within the course price? Yes, within your course fee we provide everything from a pencil and eraser, to plotters, almanacs and charts for the duration of your course. On many of our courses a textbook is also included within the course price, and this is provided to you once you've booked your course so that you can start preparing. Some students prefer to own their plotter, dividers, flash cards, textbooks and so on, and we can provide these at competitive prices from stock. For some courses we also suggest additional reading that you might find useful, and we can supply most of these recommended textbooks from stock for those who want to do additional study before taking a course. The recommended texts are available to buy at competitive prices from stock, as are other study material from pencils to sextants. Yes, our classrooms are comfort cooled (air conditioned) and have abundent natural light. It's a fact that we learn better in natural light and when we are comfortable and relaxed. So we also have ergonomic seating for extra comfort, unlimited complimentary tea/coffee and chilled water, free wifi, and the latest training equipment to maximise your learning opportunity during your course. Where does my course start and what do I need to bring? Before your course, we will have told you where it is and when it starts as part of your booking confirmation. If you are taking a practical course on the water, you should keep a good look at the weather a day or two before your course. We almost never postpone a course due to weather, but safety is paramount so if we do then we will inform you the day before your course is due to start. We have only done this once in 3 years, so it's thankfully very unusual. All the information you need about your course, what to bring, what to wear and how to find our training locations can be found on our Joining Instructions page. Please click on the link below.